Wren and Callum finally reach the Reboot Reservation, a safe haven from HARC, which controls the cities. But it isn't the paradise they'd hoped for. As they learn more about Micah, the bloodthirsty Reboot who runs it, they discover that he's been creating an army with one goal in mind: To kill the humans in the cities... ALL of them. Wren and Callum have reached Reboot Territory, a supposed safe haven for those Reboots that have escaped HARC, the Human Advancement Repopulation Corporation. After breaking into the Austin facility, Wren, Callum and Addie bring over a hundred Reboots to freedom, hoping to find a new home at the reservation. Wren may be a one seventy eight, according to the length of time it took to Reboot, but she may have met her match with leader Micah, one sixty three. Micah rules the Territory with an iron fist, and no one discusses their previous lives without repercussions. it isn't long before Wren is taken into the fold, given priority due to her status, while Callum and Addie are kept busy with remedial tasks. The group are stocked with weapons and are amassing an army of Reboots, to not only take out the likes of HARC, but they plan to change civilisation. The Reboot group from Austin have heard word of Micah's plans, and clearly tension is beginning to simmer. Wren is expected to train children as young as twelve for war, a fight she has no intention of winning. But with Callum's conscience weighing heavily on both their minds, Wren has no option than to reluctantly stay, if not for Callum then for the Reboots that have followed her. But when involving herself when a fellow Reboot is being punished, Wren finds herself on the receiving end of the brutality that is the reservation, it'll take old friends and new allies to step up and face what society has been reduced to. Man against monster, now monster against man. I loved Reboot, so unique and incredibly written and Rebel is no different, apart from perhaps enjoying it that little bit more. It picks up only moments from where Reboot left readers, standing in front of a sign which left us guessing if they had reached the sanctuary. They've got a band of fellow Reboots they'd freed from the Austin facility and need to find a safe haven, from not only HARC, but humans alike. There isn't going to be a silver lining anytime soon. I really enjoyed Wren's character growth in Rebel, she's slowly shedding her cold, assassin type lack of personality and embracing humanity. Although not completely sold on the idea, her moments of indifference allow Callum to step forward and assert himself. Something he was lacking in Reboot. 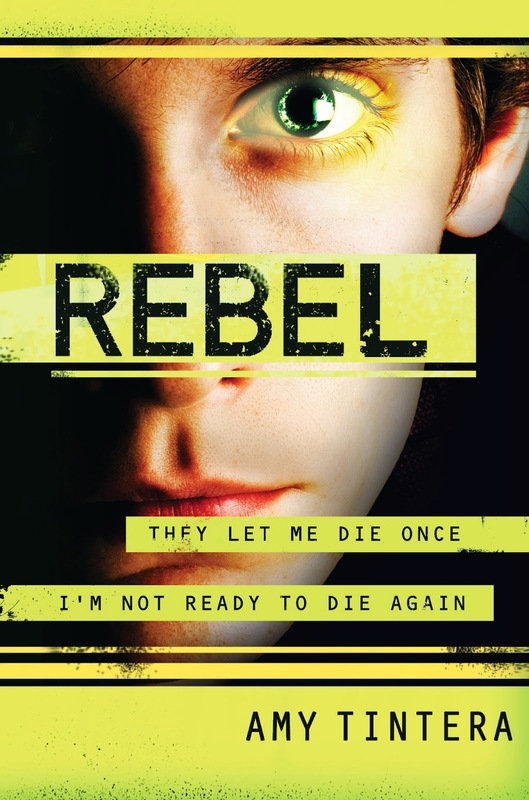 Rebel breached the gap between the clinical feeling of science fiction in book one, to the brewing revolution in which Reboots and humans will need to unite. But throughout their fight, their relationship grows into more than just an attraction and Wren's candidness really shone, finally giving her a humanity she so desperately needed. I'm loving these Duologies being released in young adult at the moment. A Duology is the new Trilogy, without the middle book filler that focuses on character relationships and drama. My only, and very mild complaint is that it needed a few stray ends that weren't polished to perfection. Perhaps a few extra chapters of battle, as the situation seemed to be a little too timely. But if my only complaint is that the storyline was wrapped up to perfection, then it's a pretty damn perfect series. Sorry to see it end. I still haven't read the first book *sigh* but I keep seeing all these positive reviews for the sequel and I am not sure why I haven't (well that may have something to do with my general reluctance to pick up dystopia lately but yeah). It IS your typical type dystopian, oppressive regime, teens fighting. But it's really well written. The storyline flows beautifully and there aren't any dull moments. I'm loving the duologies, no awkward middle books. I wasn't sure about Reboot last year but I'm more interested in this series now! And it is cool to see more duologies, I guess writers just need to focus on fitting in as much as possible into two books rather than stretching things too thinly over three books. I'm loving them too Mands. Imagine how many series would have Bern far more explosive without the usually slow and boring middle book. They're so much more action packed and faster paced. Perfect for dystopians. Ohh, the dreaded book borrower who won't give it back? Maybe send round some hired goons with a stern warning. I really hope you can get it back soon, I really think you'll enjoy the series Em. Love these Aussie Blog Tours! Twinsies. We both have the same date in the tour and rated the book the same :D haha love the review! Twinsies. Now I've got the giggles. Gina, I'm convinced we're like two peas in a pod. I own the first book and I still haven't gotten around to reading it! Even though I bought it practically the day it came out because I was so excited. I love the sound of the sequel, even though I don't know about the characters or the story, haha. If I could change one law ... I'm going to kind of cheat and say that I would change animal cruelty laws in general because they really aren't harsh enough. I could go into all kinds of reasons why but I think it speaks for itself (sadly). Agree with you 100% Chiara, especially here in Victoria where puppy farms still haven't been entirely outlawed. It's disgusting. I'm such an advocate for harsher punishment against cruelty to animals too. Glad you enjoyed it Kelly, even though I don't have high hopes because of the inconsistency of Wren's character. Thanks for the giveaway though! I think the inconsistency is a big part of her journey, the longer it takes to Reboot, the less human the teens are. I loved seeing her transformation. Definitely give this series a try, it's well worth the read. The ending was quite tidy, right?! I had some issues with the plot...buuuut, I LOVE THIS SERIES SO MUCH. I just need to snag myself a copy of Reboot and then have the gorgeous two sitting on my shelf together. With their adorable eyeballs. Although, speaking of covers, I assume it's Callum on the front cover, right? Doesn't he look awfully young?? And dorky, he looks incredibly dorky. Considering how her grows as a character in Rebel, soooo not how I would have pictured him either. It's just an awesome series, it's a typical dystopian but the storyline is really unique. Love, love, loved it too. I saw "growth" and I was hooked! I really can't wait to get to reading this one. I liked Reboot so I'm hoping for at least a good ending. Lovely review Kelly! Thanks Laura. When definitely grows as a character in this one, thank goodness. The ending is awesome, can't wait to see what you think of it. Changing a law...uh I don't think there'd be any laws that I want to change. All the ones I can think of right now I'd like to leave as is haha (e.g. don't murder others, don't steal, don't smoke in certain places). Nara you goof, don't murder others. I've got the giggles now. It really was really well wrapped up wasn't it. I loved it being a duology, but craved more fighting and rebellion. My only complaint that Rebel wasn't longer. So glad you enjoyed it as much as I did. Yay, so glad you enjoyed it, and I agree, duologies are awesome! I didn't really enjoy Reboot as much as everyone else (eep) because there was just SO much focus on the romance and I just ugh. But, I would love to see how it wraps up. Thanks for the awesome giveaway! Bloody Liberal's, they'll be the death of all of us. By the time we all reach seventy, the population will probably be forced to work until their in their nineties. We'll have no healthcare, no education. Oh, don't get me started. Their screwing us nine ways to Sunday. There's still romance in this one, but not as much as the first I don't think. Can't wait to see what you think of it Joy, and good luck.